Listed below is a sample of my 2018 Linebacker Rankings for IDP Redraft Leagues. I will update these sample rankings periodically during the off-season to reflect changes in free agency, defensive schemes, playing time, draft selections, etc. 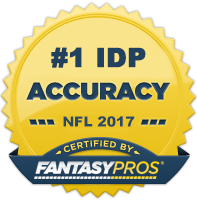 However, keep in mind that the information listed here is just a small sample of a much larger set of rankings and descriptions that are accessible through purchasing my 2018 IDP Fantasy Football Draft Guide. Linebackers are undoubtedly the staples of a fantasy defense. However, I believe many fantasy owners tend to overvalue this position on draft day. There always seems to be a huge run on linebackers early in drafts as many owners feel that securing a "top tier" linebacker is essential to having a competitive fantasy defense. Although this is a fair strategy, I think more times than not, more value is to be found within other positions at the early junctures in drafts. The fact is that there are a plethora of potential LB1 linebackers (e.g. Mark Barron, Anthony Hitchens, Tahir Whitehead) that can be had rounds after the Tier 1 and even Tier 2 linebackers are off the board. Additionally, IDP studs always emerge at the linebacker position throughout the season (e.g. Blake Martinez). So often times the best strategy is to wait until the upper echelon linebackers have been taken and then come in and start plucking up the potential LB1 upside value plays a few rounds later. This will allow you to use those early round draft picks to shore up other positions such as defensive line where more relative value is to be found, while at the same time, not suffering significant losses of quality at the linebacker position. Wagner is one of the game's most elite linebackers and that shines through in the box scores. He provides owners with top-level tackle and big play production and is a virtual lock to finish as a top five fantasy linebacker, barring injury. Seattle's defense isn't as stout as it was once so they will likely be on the field more than they have historically. This said, Wagner should see an increase in opportunity. He's a surefire LB1 and the safest bet in the 1st tier of fantasy linebackers. Mosley's 2016 season was a letdown statistically as he battled injury and failed to register more than 6 solo tackles in all but two games. 2017 was a different story however as the fourth year player out of Alabama racked up an impressive 132 total tackles (96 solo) and threw in enough big players to finish as a top 3 linebacker in most scoring formats. The Ravens failed to address their lack of quality/depth at the other inside linebacker position this off-season, so Mosley will have free reign to pick right up where he left off last season. From a pure talent perspective, Kuechly is arguably the best linebacker in the league. However, he's becoming slightly overvalued in terms of fantasy as he's still often taken as the first IDP off the board despite failing to eclipse 76 solo tackles since 2014. Granted, his production is helped by above average assist and interception totals and his solo tackle production has been limited due to injury, but it's something to consider nonetheless. He's a top 5 fantasy linebacker, just not the sure fire #1 LB he was a few years ago. If he hadn't missed two games last season, Smith would have had a good shot at eclipsing 90 solo tackles for the third straight season. He was helped to a top 10 finish last year with two defensive touchdowns. Although he's unlikely to repeat that type of big play production, he should see an increase in tackle opportunity with Paul Posluszny no longer on the team. 95 solo tackles, 25 assists, and a handful of big plays is a sound projection for Smith in 2018. With an assist-heavy home stat crew, Brown will have trouble breaking 90 solo tackles in a season. However, Brown was top 5 in terms of total tackles per game last year and is a very nice high floor LB1 option as long as he stays healthy. The Packers' inside linebacker spots had largely been a fantasy wasteland the last few seasons. This was primarily due to the team not trusting any one player with an every down responsibility. That all changed last season when Martinez played 93% of the defensive snaps and racked up a league-leading 145 total tackles. Nothing has really changed with Green Bay's situation at the position, so Martinez should have a clear path to another LB1 season. Jones built upon his solid rookie season and wound up finishing top five in the league in terms of total tackles. He also performed well in the big play category with three interceptions and nine pass deflections. He plays alongside to other young, talented linebackers but has quickly developed into the Falcons' leader on defense which will help ensure many a lot of plays continue to get funneled his way. Kwon has the potential to be a Tier 1 linebacker but he has a lot of tackle competition with Lavonte David still on the team which causes him to be a less consistent week-to-week tackle producer. He has a great ability to fill in those tackle production gaps with big plays so that from an overall point scoring perspective, he's a dependable LB1. Kirksey has been among the league leaders in total tackles for two straight seasons and although he's facing more tackle competition than ever, one still has to believe he's going to be top 10 in the category for 2018. He may not be able to break 80 solo tackles again, but his heavy assist production keeps him in the low-end LB1 conversation. The Giants have floundered at the linebacker position for several years, so it wasn't a surprise when they went out and traded for Ogletree in the off-season. He struggled last year in Wade Phillips' scheme but should rack up the tackles at a torrid pace in New York where the tackle competition is along the front seven and the home stat crew is one of the more advantageous in the league.